You count on your dryer to do laundry, but did you know that it could be a potential fire hazard? Each year lint build-up and improper dryer ventilation are responsible for more than 15,000 house fires according to the Consumer Products Safety Commission. In fact, the dryer is the number one appliance that causes house fires. How Does Your Dryer Work? A standard household dryer works by tumbling clothes and circulating hot air through them. The hot air (and accompanying lint) is exhausted through the dryer vent to the outside of the house. If lint builds up in the vent, the hot air cannot escape. 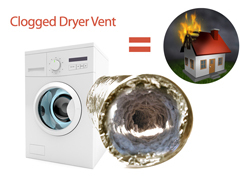 A clogged dryer vent not only creates a potential fire hazard, but it also causes the dryer to work harder to dry clothes, reducing the efficiency of the machine and causing soaring energy bills. Depending on how much laundry you do each week, a clogged dryer vent could potentially be costing your HUNDREDS of extra dollars every year in wasted electricity. Cleaning your lint trap is an essential step to reducing the effects of built-up lint in the dryer ventilation system. But that step alone will not totally prevent dryer vent build-up. A more energy efficient dryer, which can save you hundreds of dollars per year in energy costs. Improved safety in reducing the risk of dangerous fires from clogged dryer exhaust vents. Less repairs for the dryer, extending its life. Our technicians are ready to serve you with dryer vent service and cleaning. Because the dryer is constantly used for laundry, consistent periodic cleaning is necessary to maintain a safe and efficient dryer. Call Eco Pro Air at 877-799-9221 for a free quote.